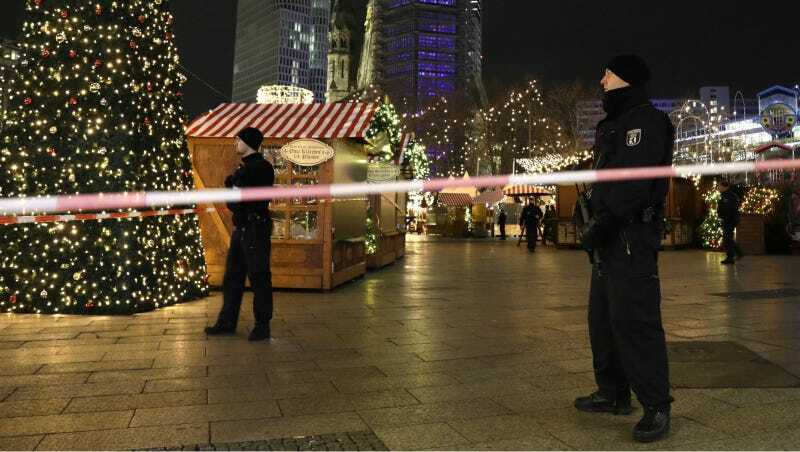 The Associated Press is reporting that nine people have died and at least 50 were wounded Monday night when a truck crashed into a crowded Christmas market in Berlin. The attacker is said to be on the run, Reuters reports. Reuters reports that local German media are speculating that the incident looks like a terrorist attack. A terrorist attack carried out by a Tunisian citizen driving a truck killed 84 people on Bastille Day this year. The driver, Mohamed Lahouaiej Bouhlel, was then shot dead by police. This is the second high-profile terrorist attack today: the Russian ambassador to Turkey was shot dead in Ankara this morning while attending an art gallery. Everything is terrible, and getting worse.